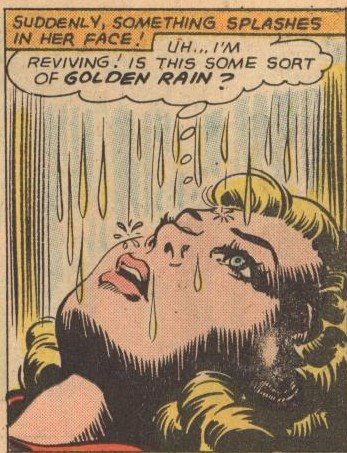 ← Random Panel: Worst. Detective. Ever. Random Panel: The best part of waking up is … not this. 11 Responses to Random Panel: The best part of waking up is … not this. Um. Wow. Where was the Comics Code Authority on that one? (With apologies to Keith Giffen) BWAAAAHAHAHAHAHA!! I’m guessing this is the handywork of R. Kelly. That is the ewwiest of ews, but still pretty funny. comic cover for the *bleep*age award of the year. Except that the Batman one was meant to be a joke. My bet is that this artist was pure as the driven snow and never conceived of the implications. You can stand under my umbrella…ella…yella…aaa! Those aren’t clouds hovering above you, lady. That’s a herd of sheep.